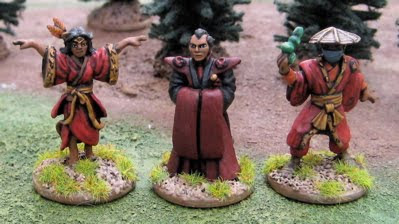 These are Crane Clan Samurai – one is another Perry Mini the other two are Kenshinzen from AEG’s L5R/clan war line. …and then not really related to birds at all we have a Unicorn Clan shugenja (Iushi Takaai, I think… also from AEG) and another converted West Wind vampire (she’s flying… birds fly…?). The other night I finished up a handful of assorted figures for our upcoming Legends of the Five Rings Campaign on Savage Saturday Night. 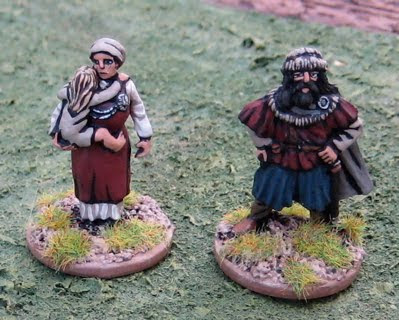 These are actually from Perry Miniatures - the first of a few I recently ordered to check them out. They’re very nice. 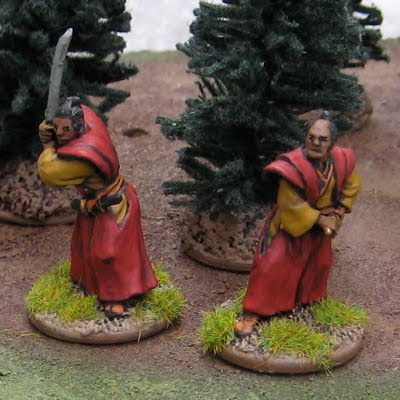 I picked up two daimyo command groups to use as general’s/camp follower stands to sit in my Samurai DBA camps. 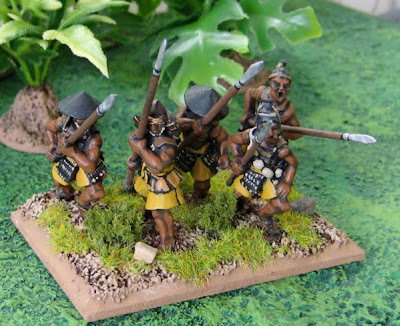 I also picked up these – a pack of samurai with swords in everyday clothes and some villagers and townspeople. 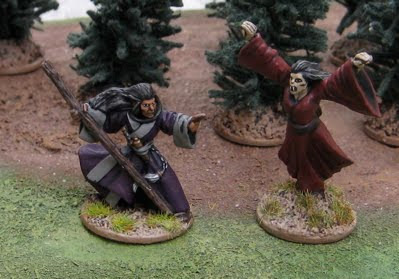 The rest are from AEG’s L5R/clan war line. A Scorpion diplomat and two Phoenix Shukenja. The Phoenix shukenja are Isawa Uona and Isawa Tadaka. I ended up with two packs of Uona and Tadaka – and I may have yet ANOTHER on the way (when you pick these up in lots of 4-6 packs… sometimes you get doubles… or triples…). So I thought I’d paint a second pair of them to make a magician stand for Hordes of the Things. Alternatively I guess I could field some archers as shooters. 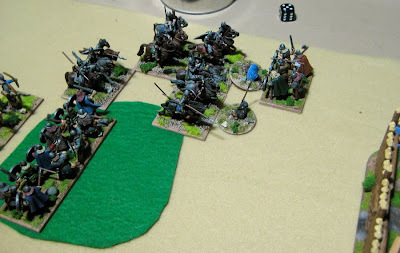 It might be a good idea as this army would have a really, really tough time dealing with bad going otherwise… Some Knights, perhaps, as I have a few figures with fully barded horses. 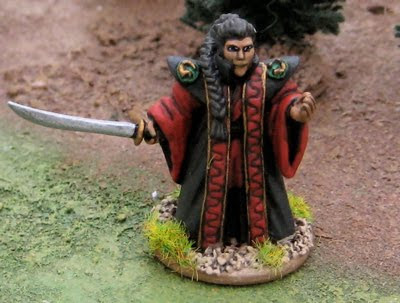 Anyway, that’s my initial ideas – if anyone out there is very familiar with the Legends of the Five Rings – particularly Clan War – and have any suggestions, I’m all ears! No jolly Saint Nick here - he's dressed in red, but if he's sneaking into your house late at night on Xmas eve it's not to leave presents - It'd be to drag you out into the street and behead you - for the good of Emerald Empire! 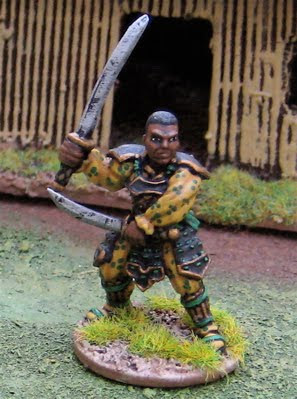 This is a Scorpion Magistrate from (from AEG’s) Legend of the Five Rings. I did the background of the mon in green because I hope someone will be playing this guy as an Emerald or Jade Magistrate on Savage Saturday night. MORE L5R/Feudal Japanese! I’ve still mostly been working on organizing and prepping figures that have been arriving over the last few days. Some samurai Cavalry arrived today… adding to the absurdly huge pile o’stuff I already have to paint – and there’s more still on the way! For the first three Tuesdays of December I’ve had a pretty regular DBA night going on. On the seventh Gary showed up with his snazzy Vikings and Christian stopped by to hammer on them with my Vikings. 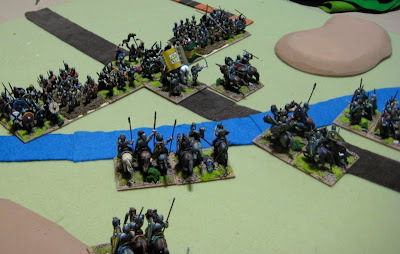 On the fourteenth Rick and Jackson showed up and played a couple of Normans versus Anglo-Danish games. 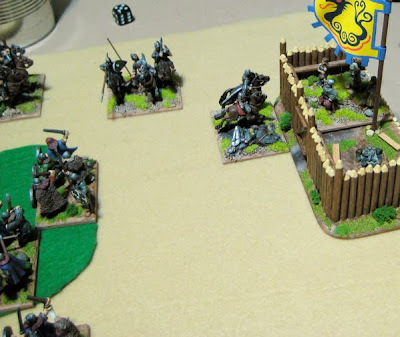 Finally , this past Tuesday, the twenty-first, Rick and Jackson and Simon (Jackson’s cousin) showed up and Rick and Jackson gave simon a bit of an introduction to wargaming! I can’t even remember what happened… I’ll have to guess based on the photos… maybe Christian or Gary can post a comment clarifying the situation…? Gary’s Vikings. Gary was defending against the Norman invasion of Scandinavia. I think he might have even been using a Liedang army…? 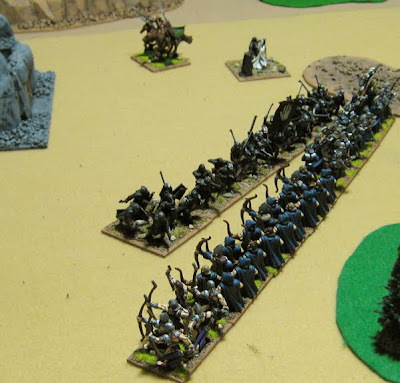 Yeah, it looks like there’s multiple bow AND a warband there – so it couldn’t have been a regular Viking army! 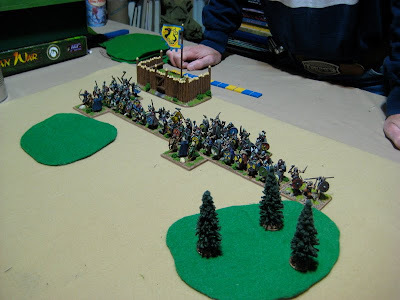 Gary actually asked to play against Normans because he’s curious to find a way for a Norse army to defeat (or at least survive) them. 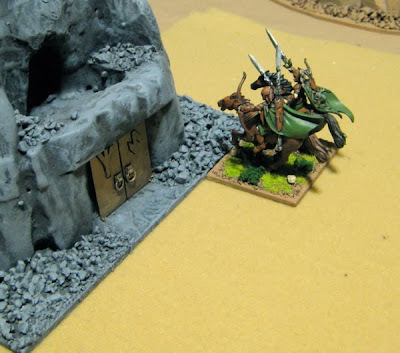 Here he’s tried to use terrain to funnel the Normans into a gap. 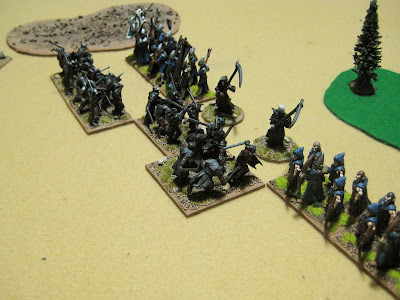 Norman Knights thundering around the flank – some of them veerig through woods no less! …and then they tried to take the camp. Apparently that didn’t work so well as there’s at least three different pics here with that same stand of Norman Knights trying to ride into the Vikings’ camp. The next week Rick and Jackson showed up. 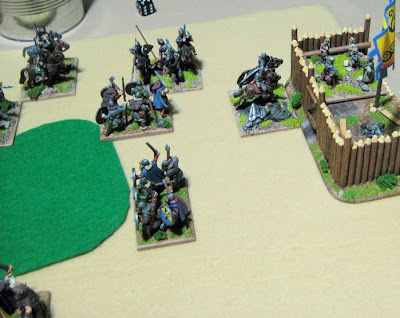 Rick was also keen to try and figure out a way to defeat the power-house Normans and Jackson likes the Knighs and has no issues with handing crushing defeats to his dad time and time again while he tries to figure out new cagey stratagems. 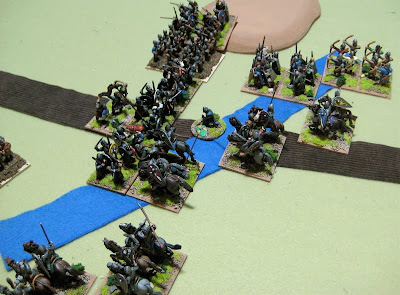 Here are the Normans (played by Jackson) gathering speed to ride down the Anglo-Danish across the field. I think the Anglo-Danish were actually invading Normandy here…!? Must have been BEFORE they planted all those hedge-rows! This was a very short game. 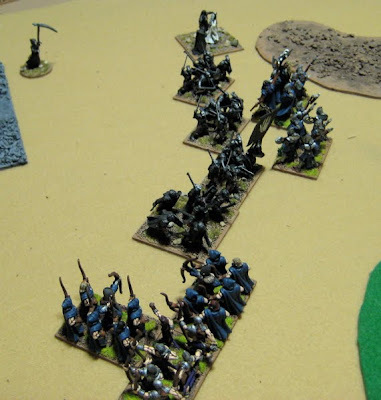 The Norman line wheeled to meet the Anglo detatchemtn on the flank and utterly destroyed them. Game over. It turned into a bit of a slog-fest. 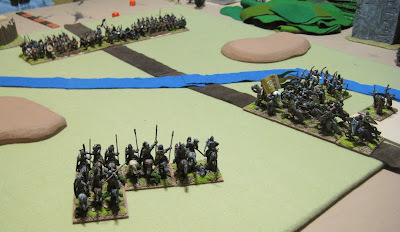 Eventually the Anglos took down the Norman general and that was it… No crushing defeat for the Anglos this time! HUZZAH! 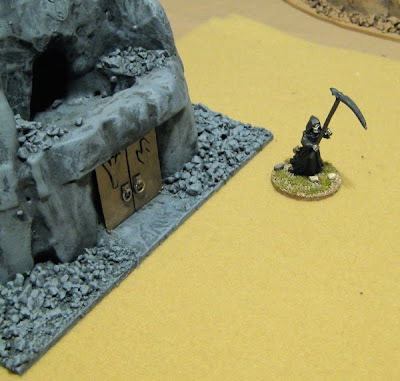 In game one Simon – who has never played any miniatures games before, chose to have DBA his first game (a sensible young fellow). He even chose DBA over Hordes of the Things! Who says the youth of today have no interest in history!? Not these lads! 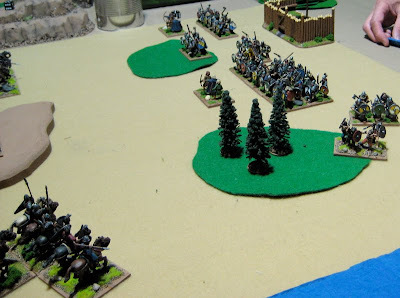 Simon took the Normans this time and defended Normandy against some attacking Vikings. Must have been a large raiding party that got a bit cocky! It was short and nasty. Normans lined up. Vikings lined up opposite them. Normans galloped up and rode down the Vikings. In game #2 Simon again took the Normans and for a second time tried to defend Normandy against another invasion of Vikings. These Vikings were a little cleverer, however, and employed cagey stratagems. I think a couple knights were lost due to unlucky rolls, a couple more were lost because, lacking any real knowledge of the rules – let alone “tactics”, Simon allowed a couple to be taken in the flank and destroyed… he seemed keen for more and as He and Jackson were off school for the Christmas break there were ready for more – but I was tired and gave them the punt! I was hoping I might get some gaming in over the holidaze but it seems like most of the locals are doing stuff with family… Perhaps that might be another avenue for opponents – my own family! Amanda’s been known to play some Hordes of the Things and there is no convincing required to get the kids to come downstairs and play with “dad’s little men”… Also my friend John should be in town visiting from Calgary so hopefully I’ll be able to get a game or two in with him! As I mentioned before I’m working on finishing off all my Games Workshop plastic Elves (and eventually Dwarves) so I can dispose of them (through trade or sale) as complete HOTT armies. 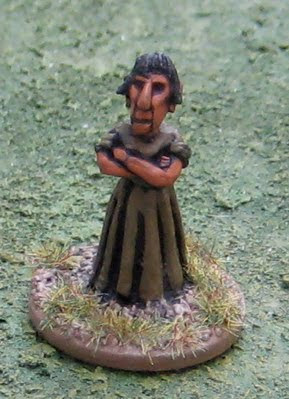 Now this may seem odd – considering I want to get rid of them – but I just won a GW High Elf archmage on ebay… The thing is I have no GW mages for my elves and it would seem wrong to sell or trade away a “complete” HOTT Elf army without a single magician stand…!? 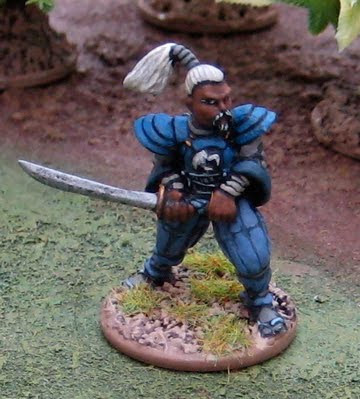 This is a female samurai from Hasslefree Miniatures painted up in Unicorn Clan colours as I have a feeling Amanda may play a Unicorn Battle Maiden in our Savage Worlds Legend of the Five Rings campaign I’ll be starting in the new year. 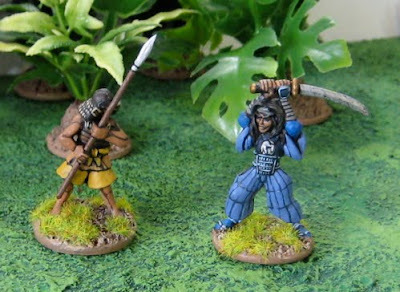 Two piles of goodies arrived in the mail today… an order of Samurai from Perry Miniatures and some METAL Elvish Knights…. Too many really… I bid on two lots hoping I might win one, but expecting that I wouldn’t win either let alone BOTH!! 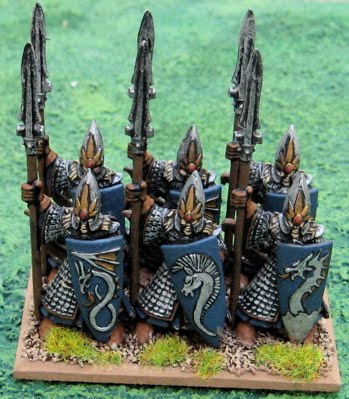 One lot is ten old-old-old citadel High Elf Illyrian reavers (like, so old that not only are the horses are metal, but the shields and spears are metal and cast on as part of the rider figure himself!?). 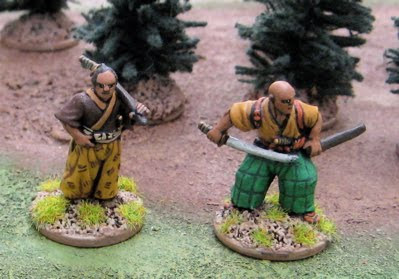 A single Ashigaru (as above) and a Crane Clan Kenshinzen (from AEG). 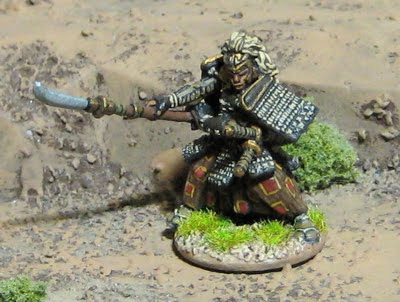 This is a Lion’s Pride Samurai from the Legend of the Five Rings. Anyway these, and the ones immediately below are from Old Glory. The above are from the “Villagers” pack. 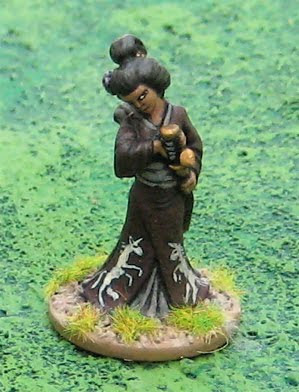 A Crane Kenshinzen from AEG’s Legend of the Five Rings. 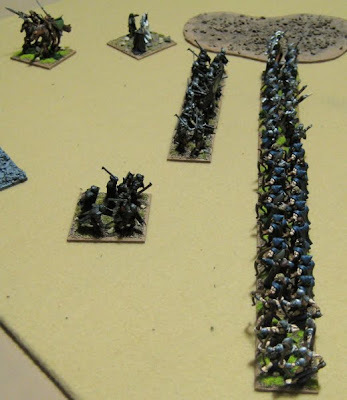 Or maybe a battle report from tonight’s game (which will NOT involve Irish…). Here we go – back to the Dark Ages of Europe! Most of the figures are from Gripping Beast (except for one tucked in the back of one of the Blade Stands which is from Old Glory). 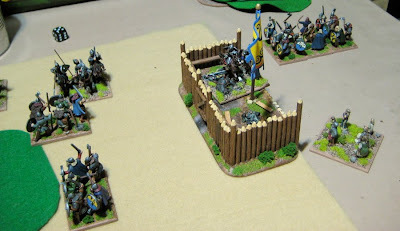 These are optional two stands of Blade for my Norse Irish DBA army. I’m not sure if they’re Irish that have fashioned themselves after the invaders… or Vikings “gone native”… or just Viking Mercenaries…. Whatever the case theere’s some definite scandahoovian influence there! Can I stick to the Dark Ages for a bit…? Finish off the Irish…? We shall see…! 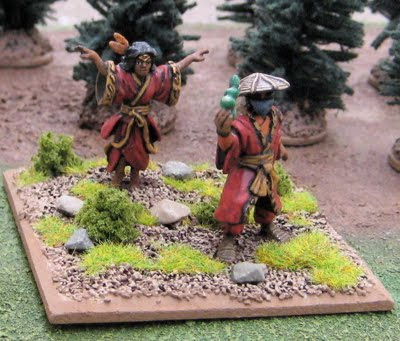 These are some “Kuni Witch Hunters” from AEG’s Legend of the Five Rings. The Kuni, I believe, are part of the Crab Clan – and so only one is painted in “proper” colours (the one in blue, brown, and red). I’ll probably just use these as generic Monk/Shugenja types in our Savage Saturday campaign. Wow I’m really going to have to step up production over the next couple weeks if I want to reach that goal of painting more than I’ve purchased. I really shot myself in the foot this week when I bid on three lots of Mega Miniatures. To be brutally honest they’re terrible figures… and I don’t REALLY have any need for them… but for about $16 I got 64 metal figures (haven’t even added them to the purchased total yet as they haven’t arrived)!? I’m just a sucker for a “good deal”. I guess I could just melt them down… Or slate them as “gifts” to give away… then they wouldn’t really “count” towards purchases for myself, right…?! I did finish up enough Irish last night to complete the two optional Blade stands – just basing them today – pics tomorrow…. This brings me to six stands (having already completed four Psiloi) and the army is half way to being fieldable - six Auxilia to go. Not “finished”, mind you – I’d need an additional two Auxilia for that! Let’s see if I can finish off these Irish in the next week…. or at least have enough of them for a battle! The “purchased” total has been starting to creep up again… faster than I’m painting at the present… doh!! This is a hero from the Dragon Clan of Rokugan! 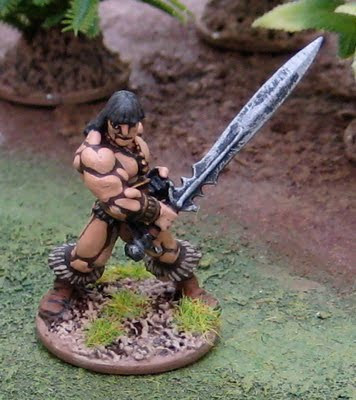 The figure is a Clan War figure from AEG… or WOTC… or Hasbero…!? Or whoever owned the rights to the Legends of the Five Rings when this was produced…!? The problem with finishing up single figures is that I end up taking pretty close up pictures – which end up being bigger on the computer screen than they actually are – thus affording me the opportunity to torture myself with observations of all the mistakes I’ve made – that would have otherwise never been noticed by ANYONE!? Slowly chugging away on some Irish and more L5R/Samurai stuff… I should actually get to have a decent painting night tonight – for the first time in a week…? Or two…? It seems like it! Wow… December… I have almost a hundred figures to paint to keep the purchased versus painted totals at least even… assuming I purchase no more figures this year… which, given the spree I’ve been on the last week or two seems unlikely. In fact I know there’s at least another 21 foot and 30 mounted on the way – and a few more that I’m bidding on!? Yikes!! The Armies of Ronarok held in their newly captured stronghold of Wienglenn content to loot and pillage therein for the balance of the year. The Dwarves retired to their capitol of Ghillebrae, expecting that the Ronarokings would come. But they did not. 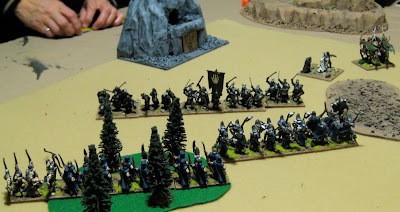 The Elves advance towards the fortress of Brashog. 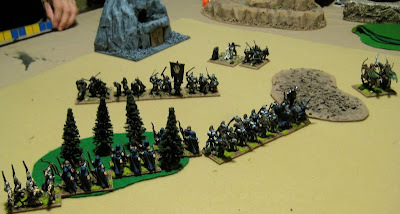 Finally close enough for shooting the elves darken the skies above the orcish line. 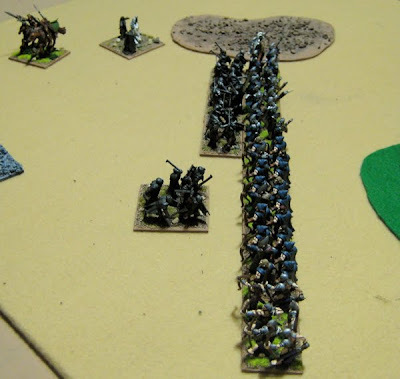 The Orc heavy infantry is driven back! 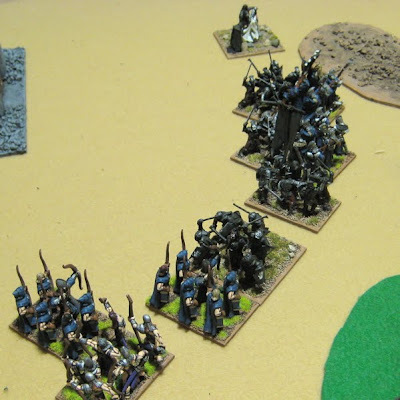 Then things started to go south for the Elves…. 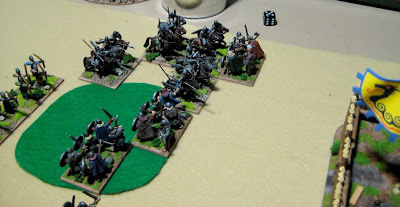 Vladimead returned to the battle and wiped out a unot of Elvish archers and the Orc General’s unit destroyed the Elvish infantry to their front! 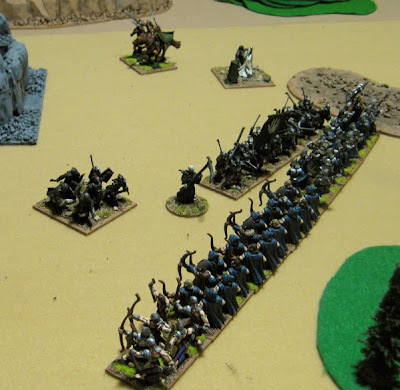 The the elite Elvish outriders – distinguished so many times in this campaign - made a desperate bid to capture the orcs stronghold behind them. It worked out for Vadimead and his guard. 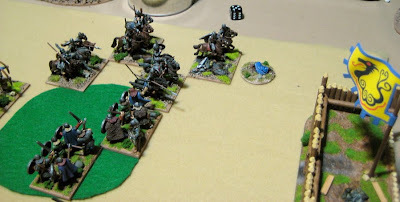 They destroyed another unit of Archers. …and that’s it! We’re calling it quits! Just about everyone seems sick of the campaign (including me) so now is as good a place as any to stop…. 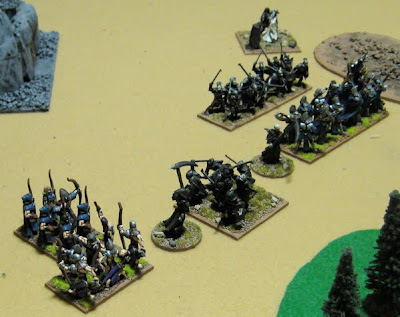 I would have liked it if the Elves could have wiped out the orcs to have SOME sort of conclusion in terms of the narrative (sorry Vlad)… but it just weren’t in the dice, so to speak. I think that’s it for email campaigns on the whole. It was fun for a bit… then it dragged… people started losing interest… I had to hassle people to get them to send in movement orders… There were some problems with the rules… meh…. I had thought I’d compile all the diplomatic messages that went back and forth and post them, but that seems like it’d be more work than I care to do at the moment… maybe over the holidaze. 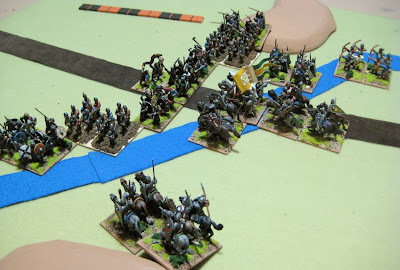 On the bright side, for a good chunk of the fall I had a few guys showing up regularly enough to play these battles that I got to thinking I might just run a campaign on Tuesday evenings involving them in the New Year. 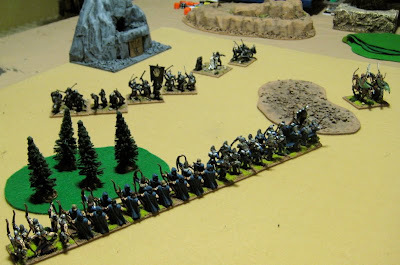 I am also still pretty stoked about the Dark Ages DBA Campaign in February (though the date my yet change and be the first weekend in March…) and running a second HOTT Summer Campaign in June. Stay tuned for more info about those in the coming weeks.